I know only what shines—not what’s there, not what’s died. Merriam-Webster defines an “exigency” as follows: 1) that which is required in a particular situation, 2) a state of affairs that makes urgent demands. Boiled down to its essence, and as it relates specifically to the book’s eponymous title, an exigency is a juncture or crossroads—a point of no return, where botched robberies and femme fatales, aborted childhoods and matrimonial jealousies, psychotic breaks and crippling addictions force characters down irrevocable paths, for better-or-worse (almost exclusively the latter). 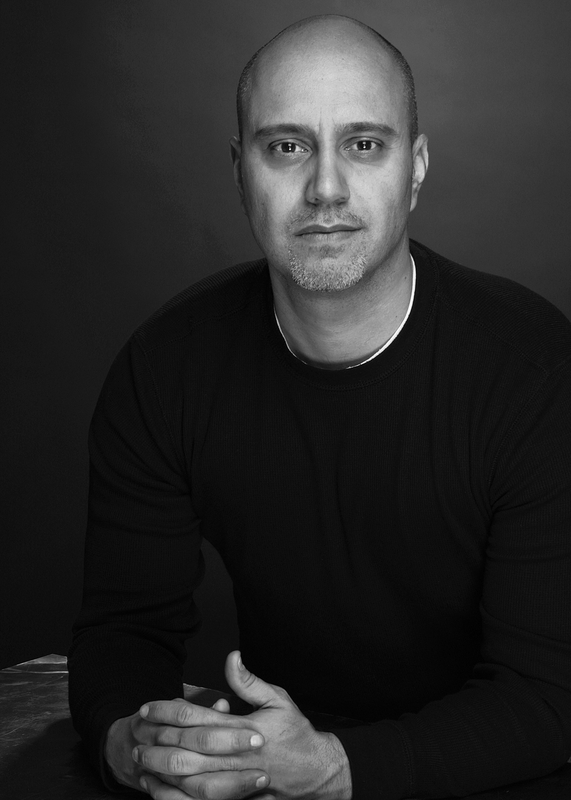 Writer-editor Richard Thomas’s latest foray into the heart of darkness, Exigencies, sees him re-emerging bloodied and ghost-staring with 23 new stories of dark, visceral impact in tow by some of neo-noir’s most promising upstarts, each exploring a critical urgency or moment that severs the mooring lines of men, women, and children clutching in vain to safe harbors. With cover art by Daniele Serra, and supplemented with interior illustrations by Luke Spooner, Exigencies seeks to view these tipping-point moments at a micro level: to the moment where a character’s decision or action becomes the hot, spinning nucleus that draws the chaos in. Whether examining the crisis of paranoia, suspicion, and addiction in Letitia Trent’s “Wilderness,” or in Damien Angelica Walters’s “When We Taste of Death,” or suffering the endless repetition of abuse cycles and blind faith in Heather Foster’s “Armadillo,” or Brendan Detzner’s “Figure Eight,” we are made witness to this optimum gravitation point. But Exigencies isn’t limited to tales grounded in reality. Neo-noir thrives as well in the bending of reality, gleefully embracing the fantastical and horrific to its bosom. In this collection one can also examine the quandaries of a daughter regarding her rapidly shrinking mother, an insect considering the existential questions of life, a disabled child pondering the healing magic of his red marionette, an entire town fending off a plague that enters through the eyes, a mind-reader using his gifts to save himself and others from mob reprisal, young witches in training being tempted by human desires, a photographer with a special camera that can turn the tables on snoops and cheaters alike, and futuristic bounty hunters fighting each other as well as the toxins of their own bigotry. Every taste and predilection is at hand, each a unique voice submitted for our approval with all their moral and mortal ambiguities peeled open. One story, “Dull Boy” by David James Keaton, even threatens to break the fourth wall in the serio-comic and self-aware examination of The Shining’s Danny Torrance, and what his adult life would be like. It’s both an homage to that novel, and an alternate take on what its sequel, Doctor Sleep, might’ve been had it been written in a pot-fueled, munchied haze. But as often is the case, the simplest stories wield the hardest impact. Two standout tales rely on the dissociation of their narrators to explore a moment where the haunting power of memory following the loss of life and love are the catalysts for revelation. In Adam Peterson’s “Everything in its Place,” a self-proclaimed observer follows the daily lives of another man and his son while relating it to his own failed marriage. The dream of converting the rambling property he’d bought with his then wife into a goat farm is both a source of bittersweet nostalgia and regret. When the property becomes an impromptu dump for passing motorists on the adjoining highway to cast off the detritus of their lives, he watches for nearly a whole month a particular man search in vain for something his wife had cast away, and the inexorable search for the elusive in us all exhumes in him a hard-earned self-acceptance. And in “The Owl and the Cigarette,” by Amanda Gowin, a black woman, burnt of her pigment in a fire, fixates on the porch light of the house across a field from hers—a source of jealousy and odd comfort. At the very moment she decides an action by which to reconcile her plight, the beautiful, elegiac tale of tragic love turns to one of ironic guilt. 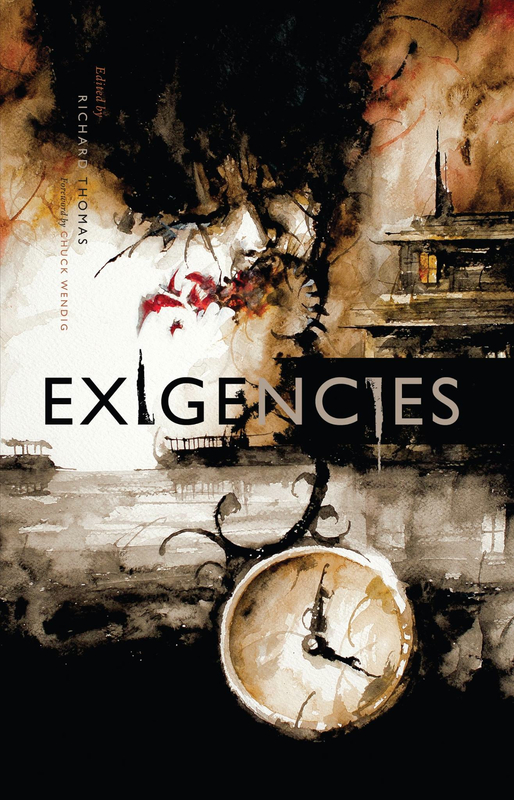 Exigencies is a progression from Thomas’s previous editorial efforts of neo-noir fiction, The New Black and Burnt Tongues, seeking to move from a general assemblage of this evolving genre’s highlights, and into a more focused exploration of theme. The stories within go beyond the build-up and reflection of conflict; they burrow directly into the marrow of it, exposing its dark, pulsing core to the light.